We've all been there. Having a party and there's a big stain on your carpet or your white carpets not so white anymore? Most carpets and rugs can be shampooed and looking like new if done properly by a professional. Replacement is only necessary for certain types of stains or if there is severe damage to your carpet or rug. There is nothing more difficult than choosing the right carpet shampooing professional when you're in a rush. There are many different companies using many different methods. With so many options how do you make the right choice? The Atlantic1 exclusive Hot Water Extraction Method, using truck mounted equipment and powerful cleaning agents make it the most effective and thorough shampooing method in the industry. Atlantic1's exclusive process begins with an all natural, hypo-allergenic pre-spray being applied to the carpet that begins to emulsify and break up the dirt and soils. Then, the 200 degree water and powerful suction extract deep down dirt, cleaning solution, and 95% of moisture for a fast drying time. It also removes dust mites, allergens, and other microscopic pollutants that collect in your carpet and can trigger allergies and other breathing problems. That's when you need an odor removal expert. 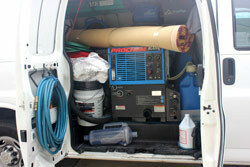 Atlantic1 has the know-how and professional products to remove complex odor problems at their source. While guaranteeing complete odor removal is not possible, we will provide you with different options depending on the severity of the damage. Atlantic1's deep shampooing process is highly effective on everyday dirt and soil buildup but no matter how careful you are you are bound to have some stubborn stains. Atlantic1 offers a wide variety of stain removers to eliminate most spots. We offer a filtration soil remover to remove dark lines along walls and behind doors, a stain remover that can eliminate or improve red wine and juice spills. We also have spotting agents to remove ink, gum, rust, grease, and many more spots. If stain removal is not possible we can provide you with an estimate to do a bonded insert or "patch" on the stained area. Oriental rugs are beautiful and expensive handmade pieces. Atlantic1's qualified technicians will give them the proper care they deserve. Oriental rugs are generally handmade with natural fibers and dyes. This requires them to be treated with special care using cleaning agents with the correct PH balance to prevent browning, color fading, discolorations, etc. We also adjust cleaning temperatures and pressures to meet the special requirements of each type of rug. Atlantic1 services specialty, Oriental, and Turkish rugs of many types of fibers including cotton, wool, and silk, as well as a variety of synthetics, such as fringed synthetics, bound synthetics, braided rugs etc. We use a whole line of cleaning agents and stain removers specially formulated to safely and effectively clean more delicate fibers. We are available for pick-up and delivery.